Spotted at a Free Speech rally in Portland Oregon. https://whiterabbitradio.net/wp-content/uploads/2018/10/header-300x91.png 0 0 H.Avenger https://whiterabbitradio.net/wp-content/uploads/2018/10/header-300x91.png H.Avenger2017-06-08 20:40:452017-06-08 20:40:45Spotted at a Free Speech rally in Portland Oregon. Sign of the Times up on the Alex Jones channel. https://whiterabbitradio.net/wp-content/uploads/2018/10/header-300x91.png 0 0 H.Avenger https://whiterabbitradio.net/wp-content/uploads/2018/10/header-300x91.png H.Avenger2017-06-08 20:38:332017-06-08 20:38:33Sign of the Times up on the Alex Jones channel. For a few days now, I had been getting calls from an unfamiliar number. I assumed it was just a solicitor trying to sell me something. After what seemed like the second or third time I have been called from this unknown number, I answered the phone this morning. It turns out that I was being contacted by a South African group called the Suidlanders. A trusted comrade in the movement had given them my number. 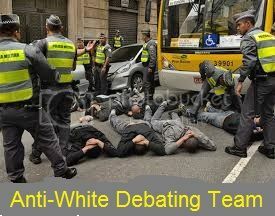 They are in the United States on a speaking tour to raise awareness about the rapidly worsening situation for Whites in South Africa. The Suidlanders are essentially the South African equivalent of our doomsday preppers except that they are prepping for the very real possibility of a Zimbabwe-style White Genocide. None of what I was told by the Suidlanders this morning came as a surprise. I’ve been blogging about South Africa for years now. In recent months, I have written about the White ghettos, the black-on-white crime, particularly the horrific murders, and the news that President Jacob Zuma had thrown in his lot with Julius Malema and was calling for a united black front to dispossess White landowners. I’ve already written about it twice on my own initiative urging President Trump to intervene in South Africa and Congress to impose economic sanctions on South Africa. So anyway, I was told the situation in South Africa is even worse than I thought. The ANC is losing power in South Africa after a 23 year reign. They are responding by scapegoating the White community for South Africa’s problems. A civil war is a real possibility. The Suidlanders believe that a full blown crisis could be upon the White community within a month or two. They are over here to raise money in the event that they have to implement their Emergency Plan. 1.) Contact your representatives in Congress and urge them to impose economic sanctions on South Africa. I’ve already done so. 2.) Publicize this story on social media. Let’s get the word out on Facebook, Twitter, YouTube. If you have a platform or radio show, contact the Suidlanders at hk@suidlanders.co.za to arrange an interview to discuss the situation in South Africa. 3.) If you support the South African cause, consider donating to the Suidlanders through their website. 4.) Pressure the Trump administration to intervene in South Africa. We made refugee crime in Sweden a big story. The South Africans are in much greater need of our help. 5.) Create buzz about this issue so it will enter the news cycle. Talk to your friends about it. Note: Check out the podcast the Suidlanders did with Jared Taylor. If you are pressed for time, skip ahead to the 29:00 minute mark to get to the gist of the situation. “Defund anti-White colleges that censor criticism of White Genocide” was submitted at the end of February to the White House’s “We the People” petition site (created by President Obama and continued by President Trump), but the petition was quickly removed by the new administration’s moderators. Those of you active on Twitter are invited to share your reactions with President Trump and his staff to their “more anti-White than Obama” policy on their petition site. The removed petition may be read at the link, and below is the notice of removal from the White House followed by our two replying emails that have so far gone unanswered. Any replies from the White House will be inserted later into this article. Your petition “Defund anti-White colleges that censor criticism of White Genocide” has been removed from the We the People platform on WhiteHouse.gov because it was in violation of the We the People Terms of Participation. Thank you for your note, and this is a request for your reconsideration. Possibly a complaint was received, but I hope that upon review you will judge that the petition fits your guidelines, or if not, you will be able to tell me wherein the particular or general violation occurs so that we can correct it. or for guidance as to wherein it violates the guidelines so that we may suitably correct it. We believe that such policies constitute a genocide against Whites in White countries just as similar polices carried out in Tibet by the Chinese constitute a genocide against Tibetans. We were impressed that the Obama administration allowed free speech on this issue on the White House petition site, and we hope that President Trump will also allow it. Over the past few weeks we have seen case after case of anti-whitism. From the professor who declared his wish for Christmas was white genocide, to a group of 4 blacks who live streamed torturing a disabled white kid on facebook for being a Trump supporter. And each time, these incidents are dismissed and covered up. What’s hilarious about the professors statements is that there is no “free expression” or “academic debate” on campus. As Bob points out in the article below, any disagreement with the politically correct line is banned and the universities screamers and thugs shut down any debate. I would ask each of you to join me in contacting Drexel University to demand an open discussion between the professor who called for White Genocide and Bob Whitaker. Will the university stand “on the side of free expression and academic debate”? In our Bizarro World, massive third world immigration into every WHITE country, and ONLY to WHITE countries, is official policy. Immigration is only the first step in this genocidal policy. In every white country there Is a policy of FORCED racial assimilation. In 2008 the President of France declared officially that this program of racial intermarriage was going too slow, and he threatened to use force to speed it up. All whites everywhere must be chased down. This policy of chasing down a race is not completely new. In the nineteenth century the United States passed a Fugitive Slave Act to chase down escaped blacks. We now have a program to chase down fugitive whites. These escaping whites are called White Flight. Policy today demands that all White Flyers be chased down. The Southern Poverty Law Center has declared that there are too many whites in Northern Idaho. They are raising money to chase them down with non-whites. Yes it sounds insane, but it is official policy today. But there is one big difference between the Fugitive Slave Act of 1850 and today’s Fugitive White Policy. Back then, Africans were allowed to condemn the Fugitive Slave Act. But no one is allowed to breathe a word against the policy of chasing down and ending the white race. Applied to any other race but whites, this Bizarro Policy would be described as genocide. The Australian Prime Minister declared that the aborigines were being subjected to quote “genocide by assimilation,” which is exactly what is being done to whites. But no criticism of white genocide by immigration and assimilation is allowed anywhere on earth. In our Bizarro world, criticism of our fugitive white policy is crushed. Anyone who dares to question this Bizarro anti-white despotism is attacked by the three groups I call Screamers, Thugs and Thought Police. Screamers are there to shout down any questioning of white genocide. They shout words like “Nazi!” “White Supremacist!” “Racist!” and “White Separatist!” One minute they scream for diversity because there are too many white people and the next minute they scream there is no such thing as white people. Anti-white screamers do not have to make any sense. They just have to make noise. Then there are the rulers of all our colleges, the thugs. But screamers and thugs are all they can use in America. In Europe and other countries they have their anti-white thugs and screamers, but mostly they just use good old fashioned Thought Police and iron bars to suppress dissent. In Sweden, any criticism of any immigration policy gets you slapped into prison. White genocide is being forced and any objection to it is attacked by the Screamers, Thugs and Thought Police. Despite all this noise and violence and Stalinist law, I choose to speak out. I invented the Mantra and the term White Genocide. I have slowly developed a meme which at least objects to the screamers, thugs and thought police. The anti-whites are finally admitting that the terms “anti-white” and “white genocide” actually exist. We are in the last country on earth where only the screamers and thugs try to silence me. This is the only country where I can challenge any of you Bizarro anti-whites to debate or question me. I doubt seriously any of the anti-whites will show up if they don’t have their thugs with them.